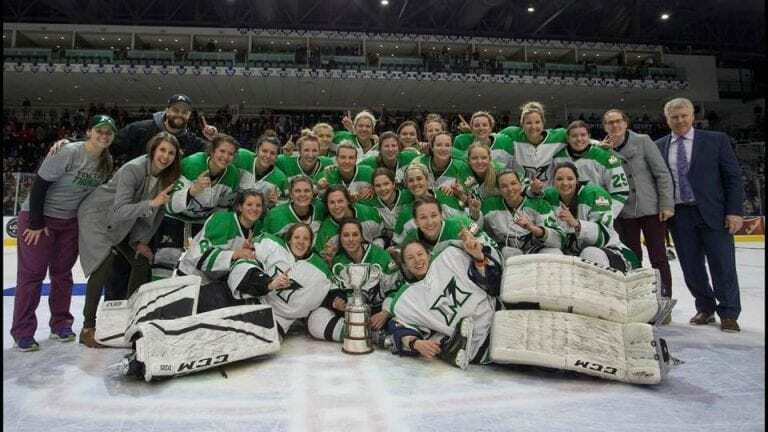 Grindstone’s very own Candice Moxley and the Markham Thunder brought home the 2018 Clarkson Cup! The hard-fought game against the Kunlun Red Star was the highlight of the Cup finals, broadcasted on Sportsnet across the country. After soaking in the recent win and excitement, Mox shared some insights on what it took for the team and her as the Assistant Coach to win the CWHL’s Clarkson Cup. What makes the win even more exciting is that this is the first Cup final for the new Markham Thunder Franchise. Markham Thunder has played against the Kunlun Red Star in the past and knew what to expect of their opponents. This helped Mox’s team to create team goals for the final game on Sunday, March 25th. Mox admits that there was an eerie calm confidence the team had for the last few weekends leading up to the finals, and as a coach she did her best to manage any issues that could have disrupted the team and the confident mindset. So, what was the mood like in the dressing prior to the final game? “Everyone was prepared mentally for the job that needed to be done, we were all there for one purpose and that was to come home with the Clarkson Cup together,” says Mox. Mox was born and raised in Markham, a city with a rich hockey history and deep-rooted traditions, so when the CWHL franchise relocated to the city, it made perfect sense to her. “What made this win special was knowing the support we had from our town, fans, friends, and especially our families,” she adds. While Mox was lucky to have her parents, aunt and uncle, and some family friends attending the game, it wasn’t the case for Laura McIntosh, or Mac #15. Mac’s mother had passed away the week of the finals and she decided to stay with the team and play in the Clarkson Cup in honour of her mom. Mox had met and spoken to Mac’s mom many times at hockey rinks and knew that she was Mac’s biggest fan. To add to the emotional and exciting game, the team’s head coach Jim Jackson’s nieces attended the game and took a picture with Markham Thunder and the Cup. “I am pretty sure I am their favourite coach, but don’t tell Jim that,” laughs Mox. Celebrating the win didn’t end at the arena. After the game one of the players tweeted out to Kip Moore who was playing a concert in Toronto that night. The entire team made an appearance and so did the Cup! 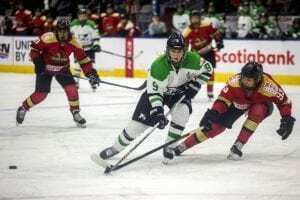 For the Markham Thunder this was a long season and the first half was pretty rough for the team, with injuries and players out of the lineup, but Mox believes that both the team and the fans knew that something special was going on from the start. “We appreciate the support! Just so happy we were able to come out on top,” she says. The team and staff have no immediate plans for the future. They have some community service events coming up this summer and a game fundraising to help fight cervical cancer. But seeing the amazing team spirit and dedication to win during the final game, we’re sure to hear more of Markham Thunder.